One of the international prototype kilograms. Since 1889, the world has used the International Prototype Kilogram (IPK) – a cylindrical chunk of metal the size of a matchbox stored in a French vault – as the standard for measuring one unit of mass. Some 40 replicas were made and shipped to countries through out the world such that an international standard could be put in place. The thing with standards is that for them to work, everything from workflow to operations to units needs to be uniform everywhere. 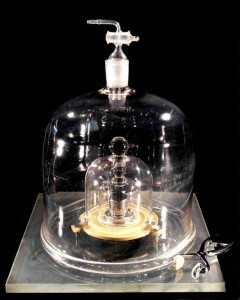 In more than a century, however, the prototype kilograms have gained a tad of weight – something that simply won’t do. A team of scientists at Newcastle University have proposed a washing protocol that should be implemented for all mass samples, in order to clean them from the impurities that causes them to push extra weight and prevent any further gain in mass. What’s the current discrepancy? Well, apparently the original kilogram was about 50 micrograms lighter than its brethren. This might seem extremely negligible but when you factor in the world’s entire mass operations, every billionth even trillionth of a gram counts. The kilogram prototypes are forged from platinum and iridium, and despite being treated regularly, they nonetheless become contaminated, predominantly with hydrocarbons that build up on the surface of the metal. The present treating method relies on hand washing that is far from uniform. Peter Cumpson, a metrologist at Newcastle, along with colleagues have worked over the past two decades to devise a method that cen be internationally and uniformly applied in order to clean the prototypes and ensure a relative error between replicas as small as possible. Their method involves exposing the metal chunks to ultraviolet light and ozone about once per decade instead of washing them, breaking the hydrocarbon bonds to the metals. “Around the world, the IPK and its 40 replicas are all growing at different rates, diverging from the original. “We’re only talking about a very small change – less than 100 micrograms – so, unfortunately, we can’t all take a couple of kilograms off our weight and pretend the Christmas overindulgence never happened. “But mass is such a fundamental unit that even this very small change is significant and the impact of a slight variation on a global scale is absolutely huge. “There are cases of international trade in high-value materials – or waste – where every last microgram must be accounted for. “What we have done at Newcastle is effectively give these surfaces a suntan. By exposing the surface to a mixture of UV and ozone we can remove the carbonaceous contamination and potentially bring prototype kilograms back to their ideal weight,” said Cumpson. The method has so far rendered results with prototype metals, like gold, and has a good chance of being implemented on the actual standards soon. Also, the researchers are currently researching alternative storage mediums for the standards to minimize exposure as much as possible including vacuums and pure, flowing argon or nitrogen atmospheres. Still, it’s rather surprising that even now in the 21st century the world has to rely on chunks of metals in order to standardize mass. Time keeping for instance, another extremely important standard, is now made with atomic clocks that only lose a fraction of a second in 14 billion years. Presently, researchers are considering using fundamental natural constants like Avogadro’s or Plank’s to standardize mass and build spheres of pure silicons with a fixed amount of atoms, instead of using a chunk of metal with variable number of atoms. Findings were published in the journal Metrologia.